0% COMPARISON RATE ON ENTIRE CAMRY PETROL AND AURION RANGE. * <(A)$91>, <(B)$100>, <(C)$108>, <(D)$122>, <(E)$109>, <(F)$122>, <(G)$154> per week is available on a Toyota Access Consumer Loan to approved personal applicants of Toyota Finance to finance the purchase of < (A)Camry Altise>, <(B)Camry Atara S>, <(C)Camry Atara SX >, <(D)Camry Atara SL>, <(E)Aurion AT-X>, <(F)Aurion Sportivo>, <(G)Presara>. Excludes Hybrids. Driveaway price of < (A)$27,990>, <(B)$30,990>, <(C)$33,490>, <(D)$38,490>, <(E)$29,990>, <(F)$34,990>, <(G)$43,990> (includes 12 months registration, 12 months compulsory third party insurance, dealer delivery and stamp duty), with 47 monthly payments in arrears not exceeding < (A)$395>, <(B)$435>, <(C)$468>, <(D)$531>, <(E)$475>, <(F)$528>, <(G)$667> and a balloon final payment (equal to the GFV) of <(A)$9,442>, <(B)$10,562>, <(C)$11,496>, <(D)$13,530>, <(E)$7,691>, <(F)$10,170>, <(G)$12,619>. Additional interest charges accrue whenever a balloon final payment option is selected. Based on a comparison percentage rate of 0%. Terms, conditions, fees and charges apply. Offer valid until 30/06/16 unless sold out prior. 0% comparison rate is available to approved personal applicants and a 0% annual percentage rate is available to approved Bronze & Silver Fleet and Primary Producer applicants of Toyota Finance. Finance applications must be received and approved between 01/06/2016 and 30/06/2016 and vehicles registered and delivered by 30/06/2016. Offer not available to government, fleet or rental customers. Maximum finance term of 48 months applies. Terms, conditions, fees and charges apply. Comparison rate based on a 5 year secured consumer fixed rate loan of $30,000. WARNING: This comparison rate is true only for the examples given and may not include all fees and charges. Different terms, fees or other loan amounts might result in a different comparison rate. 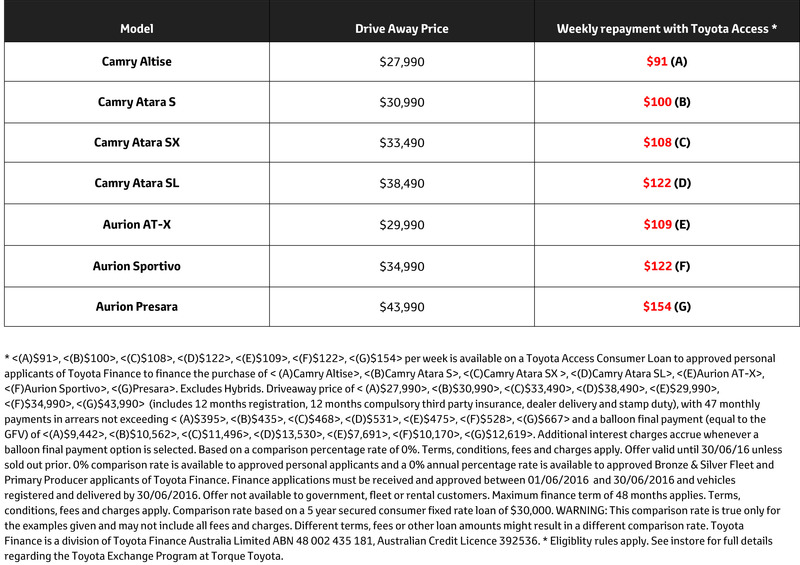 Toyota Finance is a division of Toyota Finance Australia Limited ABN 48 002 435 181, Australian Credit Licence 392536. * Eligiblity rules apply. See instore for full details regarding the Toyota Exchange Program at Torque Toyota.